If you have not heard about the website, Pinterest, and you are at all interested in cool things, you should check it out. You can make virtual pin boards about anything. I choose to pin pictures of DIY craft projects I want to do, recipes I want to try, gorgeous pictures of shoes I wish I had, and other fun things. You can follow me and all of my boards here. I found this great craft on Pinterest. It originally came from the Family Fun website, and was a craft for children. Perfect! I can’t screw this up. I thought it was really cute and kind of an anti-wreath for your front door. Also - it’s called Pinecone Swag. What’s better than that? I hate cheesy autumn decorations, and I thought this was anything but. Knowing I wanted to make this craft, while babysitting my cousins, we took a walk in the woods to look for pinecones. It took awhile for them to figure out exactly what I was looking for, but shortly we had a huge bag full of pinecones. When I got home, I realized I forgot all the pinecones. They live about 35 minutes away so I kept thinking I had to go pick those up. However - on a lovely Sunday afternoon GB and I decided to take the dogs for a walk. I came across a ton of pinecones, just the right size. I scooped them up and took them home. I had to go to the local craft store to pick up ribbon, but I was going to use the wire and paint I already had at home. This was an almost free project. I had some wire scraps left over from the wall jar vases project. The wire was too unruly and too bust trying to scratch me to pose for the following photo. When I got the paint out at home I realized I didn’t have yellow or orange paint. The very colors one needs for a fall decoration. I didn’t care. I was going to craft no matter what! It was pretty difficult bending the wire to the shape I wanted but I persevered, and came up with lots of loops for the ribbon. Next I hot glued the wire to the pinecone. The glue was kind of creepy at first, but I just thought it looked like sap. I used approximately 3 mini hot glue sticks for this project. I’m thinking of investing in a big hot glue gun. I used what paint I had, mixed up some colors and painted one side of each pine cone. Then it had to dry. I hate waiting. 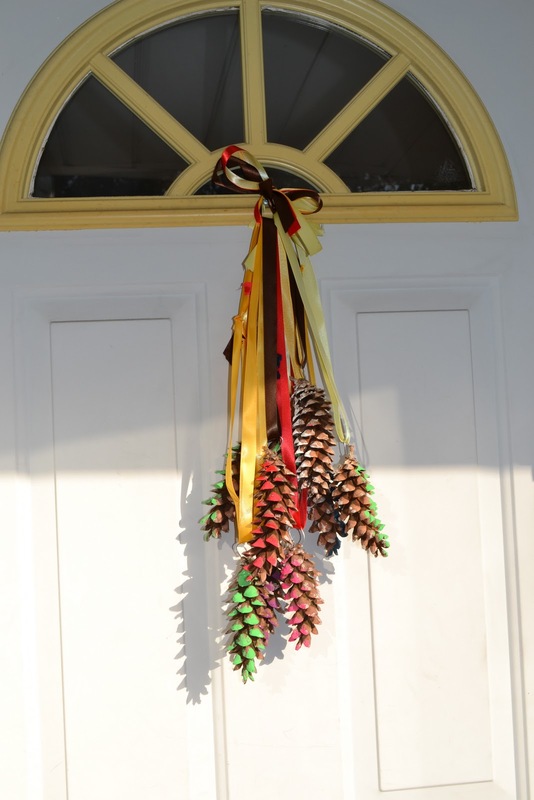 When I thought it was dry I began tying the ribbon each pinecone, and then tied them all together at the top. Clearly, it wasn’t all dry. Notice the paint on the ribbon. All finished on the door. Pleasantly surprised, but I definitely would recommend making sure you have the right color paint as well as waiting until the paint dries. My sister Sly came over recently, and told me she noticed the paint on the ribbon right away and it didn't look so great. The ribbon colors could seemed not quite autumn, not quite xmas. Otherwise good for you for making something and Not getting CVS toss aways. A story making something is always better and this was a good one.